Hi-Po Dophilus™ is a probiotic in a capsule. Probiotics are live organisms (which need to be abundant) in your intestines to support assimilation of nutrients and infection prevention. Hi-Po Dophilus™ has both of the most important probiotics that you need! Lactobacilius acidophilus (providing 10 billion active organisms) and Bifidobacterium Bifidum (providing 500 million active organisms) which can replenish and even enhance the correct quality and quantity of healthy bacteria lost. See the table below for how it is lost and what it means to have it restored. Provide support for food sensitivities. 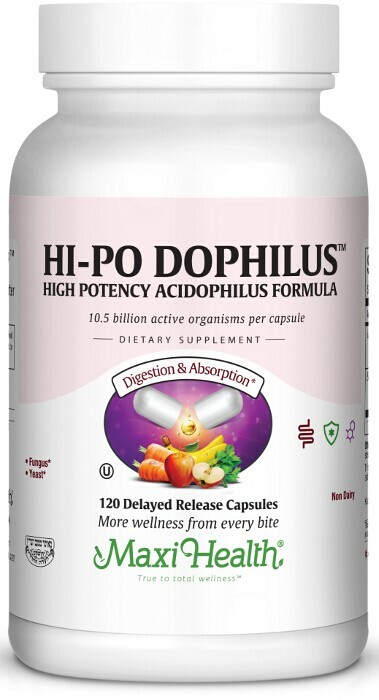 When you or a family member needs a probiotic, make Hi-Po Dophilus™ your choice. Take one (1) Maxicap™ before a meal, or as directed. This product contains no animal products, soy, wheat, yeast, salt, gluten, milk, artificial flavors, colorings or preservatives. I use your Hi-PO Dophilus every day. I suffered from yeast and thrush while nursing. Now I do not itch. It's a life saver! When I take Hi-Po Dophilus, I don't have yeast infections. Thank you for these wonderful products.